Lohscheller said Opel's PACE plan will "unleash automaker's full potential." He is pictured at a news conference in Ruesselsheim on Thursday. 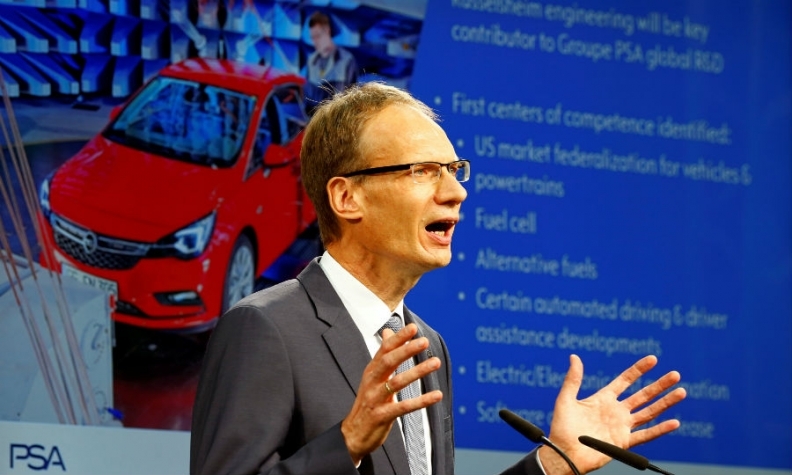 FRANKFURT -- Opel CEO Michael Lohscheller announced the German automaker's first business plan under new owners PSA Group, promising to launch electrified cars including a full-electric Corsa and move to PSA platforms faster than planned. Opel will also aim to avoid forced lay offs as it seeks to become sustainably profitable, he said in a statement on Thursday. A lower breakeven point for Opel based on annual sales of 800,000 vehicles. Last year's volume was 1.16 million. By 2024, all Opel product lines will be electrified. The automaker will offer battery-electric or plug-in hybrid versions alongside models with internal combustion engines. By 2020, Opel will have four electrified car lines, including a plug-in hybrid version of the Grandland X SUV and a battery-powered version of the next-generation Corsa. Opel reiterated its target of a 2 percent operating margin by 2020 and 6 percent by 2026. Opel and UK sister brand Vauxhall will shift its entire model lineup onto PSA's architecture faster than previously planned to secure savings, rolling out nine new models by 2020 and completing the transition to PSA technology four years later. PSA, which agreed to buy Opel from General Motors in March, had said at the time that the convergence of vehicle architectures would begin in 2019 and take another eight years to complete. "PACE will unleash our full potential. This plan is paramount for the company, to protect our employees against headwinds and turn Opel/Vauxhall into a sustainable, profitable, electrified, and global company," Lohscheller said in the statement. Lohscheller said improved competitiveness of Opel's manufacturing plants will lead to new vehicle allocations that will provide a better utilization rate for the next decade. PSA's two platforms, CMP and EMP2, will be localized in all Opel/Vauxhall plants. An EMP2-based SUV is planned for Eisenach, Germany, in 2019 and an EMP2-based midsize vehicle will be built in Opel's main plant in Ruesselsheim, Germany. The number of Opel platforms will be reduced to two by 2024 from nine now. Powertrain families will be reduced to four from 10. "Aligning architecture and powertrain families will substantially reduce development and production complexity, thus allowing scale effects and synergies, contributing to overall profitability," Lohscheller said. Counting every body style, Opel will launch nine new models by 2020. The first will be the Combo car-derived van in 2018 and the next will be a new Corsa subcompact in 2019. This lineup will enable Opel to increase its pricing power and reduce the gap against benchmark brands by four points, Opel said. Opel pledged to avoid any factory closures or forced layoffs, instead relying partly on exports to fill its underused factories. Opel's "clear intention" is to maintain all plants and avoid compulsory layoffs, Lohscheller said. Wage costs will be pared from about 15 percent of revenue to an 11 percent benchmark as Opel negotiates voluntary departures, early retirements and shorter hours with its workers - part of a broader effort to cut 700 euros of costs per vehicle. Opel's huge technical center in Ruesselsheim will engineer all new Opel vehicles. It will become a global competence center for PSA, building expertise in areas such as fuel cells, automated driving technologies and driver assistance features. The brand's renaissance and return to profit will be based on "German engineering for all and a perfect match with PSA brands' positioning," Lohscheller said, referring to the Peugeot, Citroen and DS marques. Opel left its synergies goals unchanged. It aims for 1.7 billion euro synergies by 2026, with roughly two-thirds or 1.1 billion euros due by 2021. "The good news is that synergies are validated (at) a detailed level," Lohscheller said during a conference call with journalists. The strategy outlined on Thursday included plans to enter 20 new markets by 2022. China and Brazil will be among the markets under consideration, Lohscheller said. PSA shares fell 2.2 percent to 19.70 euros at 1217 GMT, after Chief Executive Carlos Tavares said Opel's financial health had worsened as plans were being drawn up. "The situation gets worse by the day," he said, without giving details.